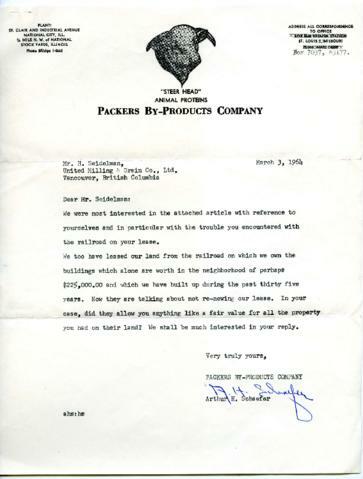 Letter from Arthur H. Schaefer of Packer By-Products Company in the United States to Harry Seidelman in Vancouver, dated March 3, 1964. In the letter Arthur H. Schaefer refers to Harry Seidelman's message to the editor of Feedstuffs journal (see previous Item 14 of this file) to ask Harry a property leasing question regarding his own business. The clipping of Harry's message to the editor is paper-clipped with this letter.